Saratoga Hickory T-Molding is the finishing touch to your new floors. T-Moldings are installed between flooring of the same height or to gain expansion space. Zamma transitions and moldings are designed to coordinate with your laminate floor. Buy online Zamma Saratoga Hickory Handscraped 7/16 in. Thick x 1-3/4 in. Wide x 72 in. 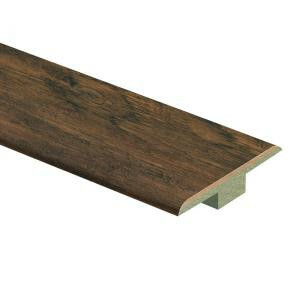 Length Laminate T-Molding 013221608, leave review and share Your friends.